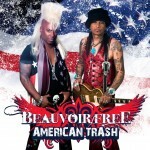 Share the post "Album review: BEAUVOIR/FREE – American Trash"
“American Trash” by Beauvoir/Free is a Crown of Thorns album in all but name and is a welcome return to the classic melodic rock sound of yesteryear. Jean Beauvoir, he of the impressive ever-present white Mohican, has teamed up again with old friend and guitarist Micki Free. From the off “American Trash” is a melodic rock fan’s dream come true. Angels Cry just radiates class, Morning After features some effective bluesy guitar from Mr Free and title track American Trash draws parallels to the classic American Woman as covered famously by Lenny Kravitz. The brooding Cold Dark December kicks off with a borrowed Foo Fighters riff but soon ploughs its own path through to its sing-along chorus. She’s a KO reminds me of Cheap Trick’s classic Little Sister at times. The soulful emotive vocals of Jean Beauvoir are superb throughout and Micki Free’s guitar playing and solos are just wonderful…every note in every solo fits perfectly and nothing outstays its welcome. This entry was posted in ALBUM REVIEWS, ALBUM REVIEWS (Mobile), All Posts and tagged album, American Trash, Beauvoir/Free, Crown Of Thorns, Frontiers, Jean Beauvoir, melodic rock, Micki Free, review. Bookmark the permalink.